You can learn how to homeschool preschool! When I first started, I was so intimidated. I wondered what my child would need to know to be ready for kindergarten. Although my kids were learning through play, they weren’t learning some things yet like letters and sounds. I wanted to be sure they were not behind, especially if I was considering sending them to kindergarten. Sending both our kids to preschool is too expensive at this point. So after a short unnecessary panic, I started researching what kids need to know before kindergarten. Then, I found resources that would help me teach them in ways that were fun! You can do this. If you are trying to decide if homeschooling is right for your family, read about the pros and cons of homeschooling here. What do kids learn at preschool? Update 2018: I highly recommend you find out what your school district would like kids to know entering kindergarten. This varies by state. There is no common core curriculum for Pre-K, but most states have adopted the common core curriculum which starts in kindergarten. Parents send their kids age 2-5 or so to preschool in the USA. You are probably already doing half this list without trying to “do preschool” just by spending all day with your kids. Most of what they need to learn will come naturally through play, reading books, and chatting all day with mom. The rest is just a matter of you being intentional to fill in the gaps. Be able to rhyme words with a new sound. For example what rhymes with ball and starts with the sound “t” (tall). Art supplies for preschool craft activities. This reading book for my 4 year old to learn sounds and letter names. This preschool activity book that works on colors, shapes, patterns, tracing, and letter recognition. 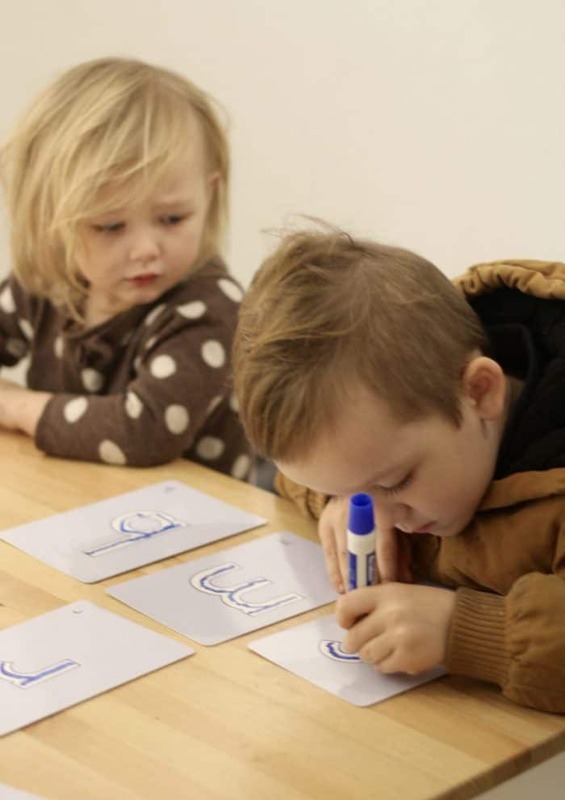 Kumon dry erase uppercase & lowercase flashcards to practice tracing letters we learn. First off, you do not have to spend a bunch of money on preschool curriculum. There are TONS of free resources out there. You can easily find free letter of the week activities on Pinterest if you choose to structure preschool activities around that. For my 4 year old, I chose not to do a letter of the week themed preschool. Instead, we do lot’s of hands on play, about 15 minutes/day of reading out loud, and about 30 minutes/day (often every other day) of structured learning. I think as mamas who want to homeschool preschool we tend to forget how most skills are learned at this age. It’s from playing and being with mom and asking questions ALL DAY. Don’t undervalue this, because it’s so influential. I get really overwhelmed with so many great ideas out there, because I feel like I’m always missing something. I’ll see a cute preschool theme on space, or dinosaurs, or (insert hundreds of possible cool things to teach) and wonder if I’m not doing enough. Those things are just fun ideas, not requirements. What you need to do is figure out the most important things you have to cover before kindergarten, and then then add in other topics you have time for. Follow whatever your preschooler is interested in, and they will be much more excited about it! I think it’s helpful to order a few crafts and tools online to have around. You cant really go wrong if you find tools to show them numbers, shapes, letters, and colors. I like the morning after breakfast. I’m fresh, we haven’t done any T.V. yet, and we can still go to the park or have a play date after. This is my one on one time with him where I’m the teacher. These are usually activities that involve me teaching letters, sounds, and any writing/tracing. I adjust this to fit what he’s interested in and seemingly capable of. We have the Big Preschool ABC book pictured below and it’s awesome! If you just want one item to start, try this. There are 300 pages inside, with tons of tracing, coloring, counting, matching, numbers, patterns, and more! My 4 year old boy loves it, and can do 3-4 pages at a time. Update May 2018: We LOVE the Big Preschool Book, but should have ordered 2 since my 3 year old wants to participate now (although she’s sloppier and often just colors the pages). We have just been tearing out pages for her, and they do tear out easily without ripping btw! Below are some fun activities for your tool kit. The Melissa and Doug duo below has activities for using scissors and tape (scissors and tape included), and if you are looking for just cutting practice the Kumon book has 80 pages of cutting practice for beginners, ages 2+ (although most reviewers say it’s perfect around age 4). You will have to buy a pair of safety scissors separately though with the Kumon book. If your kids are different ages, you may need to have two separate one on one times. Which also means finding something to keep the other kids busy. My almost 3 year old girl does not really “do preschool” yet. She plays with her brothers, draws, traces, and learned shapes and colors without formal teaching. She listens to stories and loves hands on activities, but her attention span is just too short for formal learning yet. Plus, she shows no interest. Her preschool is 100% play school right now. Update November 2018: My daughter is now 3.5 and it became obvious when she recently wanted to learn more. For the first time she has gotten excited about tracing letters, learning patterns, letter sounds, and starting the reading book I mentioned earlier. If I would have tried to force this on her 6 months ago, it would have been a constant frustration for both of us! And completely unnecessary. I’ve seen a huge difference in what my boy and girl have been capable of at parallel ages. I’ve learned boys are usually (not always) quite behind little girls at this age, so don’t worry. When it comes to how to homeschool preschool, there are MANY good ways, and it might look different for each of your kids. How much time should preschool take each day? We spend about 30 minutes a day intentionally learning sounds/shapes/tracing/or letters/etc, and then read books! If you want to include the unscheduled painting session we ended up doing (just an example), then you could add on 15 minutes. Does preschool at home need to be every day? At this age, preschool doesn’t have to be every day. I have friends who do a preschool co-op and they meet two days a week for a couple hours. They include circle time (for songs, learning days/months of the year/ and seasons), a letter of the week activity, and a craft around that letter. Most preschool-aged kids only go 2-3 half days a week for around 4 hours, unless their parents are paying a lot more. And they are not “doing school” the whole time. There will be art, crafts, games, songs, free play, snack time, lunch time, reading out loud, and more play time. Preschool teachers work hard, and are great at keeping attention spans that are short! School is happening ALL day because they are always asking questions, wanting to help, to build, to climb, to bake, helping mom match socks, counting how many books we have, you get the idea. But to keep myself accountable, I made this easy schedule. Save it and print to help get yourself started! Most people I’ve learned from recommend doing school as part of a routine. Not necessarily at a set time. That way the kids know what’s coming next. We do 1-2 short blocks of more formal learning each day before lunch. 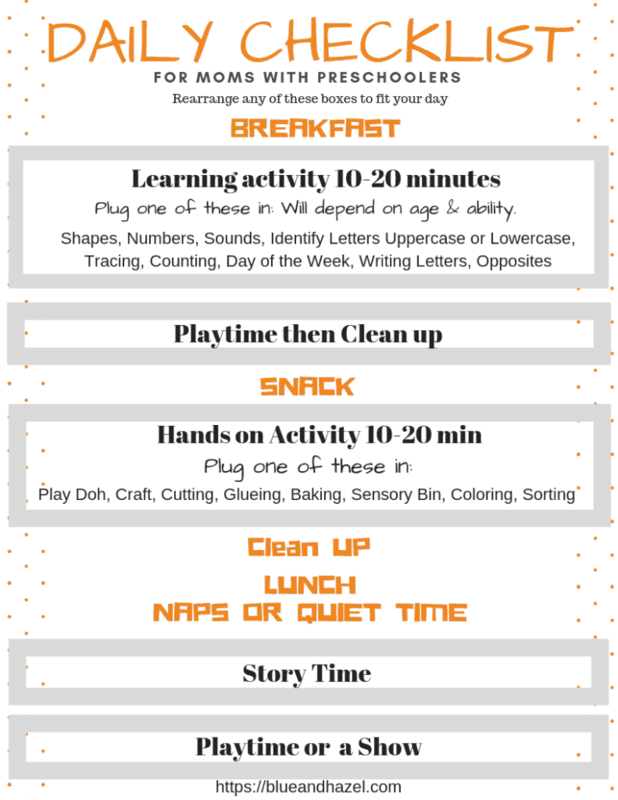 Save and print this basic homeschool preschool routine! It’s easy and gives your day a little more structure. Just add your own preschool activities, or use some of mine. I say blocks of time because my 3-year-old’s attention span is a lot shorter than my 4-year-old. So a block of time for her is around 10 minutes (and like I said, we don’t formally do any preschool for her yet) and a block of time for my 4-year-old is 10-20 min. Read out loud for about 15 min. Watch a show, run errands, play date, or just play at home till lunch. Afternoons we play, build, make food, go outside, or watch a show if I need to get something done. First we eat breakfast, the kids play while I finish my coffee, and then I do a reading lesson out of this reading book with my 4-year-old while my 3-year-old plays and my baby is still sleeping. This takes us about 15 minutes. It has taught him all the letter sounds, sound combinations, and how to sound out words! Without this book, you would need to find another way to teach letter sounds. After that he gets to watch a 30 minute show. It motivates him to read, so I’m fine with that! We are in lesson 20 and he can already read sentences like “An ant sat on a seed”. Next we do a few pages from the The Big Preschool Workbook, or Dollar Store workbooks with games, matching, tracing, etc! This would be the time to try out any preschool learning activities that you find on Pinterest. Last, we do a hands-on activity that does not require my full attention. Pinterest can be your best friend if you need ideas, but think Play Doh, build a fort, color, scooping, magnetic tiles, glue stick and paper, etc. Check out my post to see how you can teach your child to read, plus a video of him reading! And by the way, this is just a bonus because your child will not be learning to read like this at preschool if you send them so no pressure! Do they point at shapes and say the name? Teach them more shapes! Do they guess the wrong color on a shirt? Teach them more colors! Does your preschooler hold coins they find and guess the name? Show the names of all the coins! Has your preschooler scribbled to pretend writing? Teach them to hold a pencil and how to draw a circle and a vertical line (pre-writing skills). Are they trying to write a letter but you can’t recognize it? Perfect time to start tracing letters. My kids are so much more engaged when we learn through games rather than flashcards of any kind. For instance, learning to recognize numbers is more fun when you play a match game or do a “connect the dot” picture then just a flashcard. Basically every day I just ask myself did they learn something new? Do an activity? Play nicely? Get exercise? Then hurray! For number recognition, they have mostly learned these through books, and naturally throughout the days by pointing out numbers on boxes, receipts, or anything really. They also learn them in the Big Preschool Workbook through matching games and connect the dots. 0 now when jumping, and it’s the best way to tire them out! Sometimes I just count, and other times I make them count with me. I also ask them how many of something there is, like cereal bowls on the table. Or buttons on a shirt. Or bananas in the bundle. Then I help them count while I touch each one. Over time you will see them go from needing you to point to being able to do it themselves! It’s cool. We use the book “Teach Your Child To Read in 100 Easy Lessons”, and it does not teach letters in order from A-Z. It teaches the lowercase letters (first as sounds, later the letter names). If you do not use this book, you will want to find another fun way to teach letters and the sounds they make. Lots of mamas use a letter a week curriculum! That sounds very fun but will need a little more planning. enough, even if you are far away from teaching the alphabet. This is an especially great tool to take to doctor appointments, in the car, or on an airplane. For beginning letter tracing, we love these dry erase flashcards. They have letters on one side and pictures that begin with that letter on the other side they can color. I only do this as they are interested, starting around age 4.My almost 3-year-old is not yet learning letters, although she is capable I think. She just likes to color in the letter 🙂 Here’s an in depth look at how we are teaching my son to write letters of the alphabet! I like that these tracing cards have a star to know where to start, arrows to tell which direction to go, and where to end. We teach sounds before letter names using our reading book mentioned above. It is easy and teaches me exactly what to do and say. Honestly, I hadn’t taught sounds to my son till we started the book. I’m just 20 lessons in and my son can say SO many sounds and words! Just today on our way into church, he stopped to look at the “sounds” he saw on a car that spelled out “J-E-E-P”. We point out sounds he has learned in the book all throughout the day, like on books, cereal boxes, and packages. Most baby books start with shapes and colors. Mostly my kids have learned these just by talking with me and in books. Lots of my friend’s kids know their shapes and colors by age 2 from learning shows or apps. We also love this clock below for teaching letters, colors, and numbers. It’s a really great educational tool that the kids love to play with, and I’ll use it later on too when I’m teaching them to tell time. Lots of preschool moms enjoy matching a hands-on activity that matches the letter they are working on, or the color, shape, etc. I don’t really plan enough yet to do that, (you crafty moms are amazing to me!) so instead I just kind of rotate through sensory activities. This includes Play Doh, digging outside, stacking blocks, making indoor obstacle courses, sorting toys we have by color or shape, sidewalk chalk, cooking with mom, and crafts if I can get to the dollar store once in a while. Call it preschool if you want. I think a lot of it is just a day in the life of a stay at home mom, for real! Check out this post to see how we made this easy outdoor kitchen using junk we had around the house. What I like least about teaching preschool is coming up with activities. If you are like me in that way then tap into other mom’s creative juices on Pinterest and find 10 things you could easily do if you had the supplies. The other hardest part is just starting. With the arrival of our third baby I felt pretty frazzled and stretched for time. How in the world was I going to add something like preschool? The truth is, not much got added, but I became a more intentional with early reading and letter tracing. All my mom friends were sending their kids to preschool 2-3 days a week and getting a break, which quickly made me feel sorry for myself that I didn’t get one (embarrassing to admit, I know!). Once I got over my pity party and made a plan, which you now have from this post, it got easier. After doing this for a few months now, I see it takes a lot less time than I thought, and it is actually pretty cool to see them learn stuff. Update October 2018: How preschool at home has turned out after 1 year. My kids are now 3.5 and newly 5, and I’m doing preschool with both while my 1.5 year old often interrupts or needs something. It’s a new challenge, and hard to juggle because interruptions happen every time! I now do one on one time with each. Thankfully there is one kid to distract my toddler. The reason I’m happy with our laid back approach so far is that my new 5 year old is showing huge progress! He’s writing some letters (including his name) and reading level 1 books from the library (with help). He can recognize numbers in random order, count to 30 (easy to learn if you just do it in the car for “fun” haha), knows most letter names and all their sounds, shapes, colors, and still plays 90% of the day. So even if you think you couldn’t possibly homeschool your preschooler, you totally can! You really can’t mess it up if you can teach the list I mentioned earlier. And maybe you will love doing homeschool preschool so much so much you will keep homeschooling into Kindergarten! Related Post: How to potty train boys; Everything you need to know! Here are two other amazing homeschool mamas to check out. They will show you how simple preschool can be. 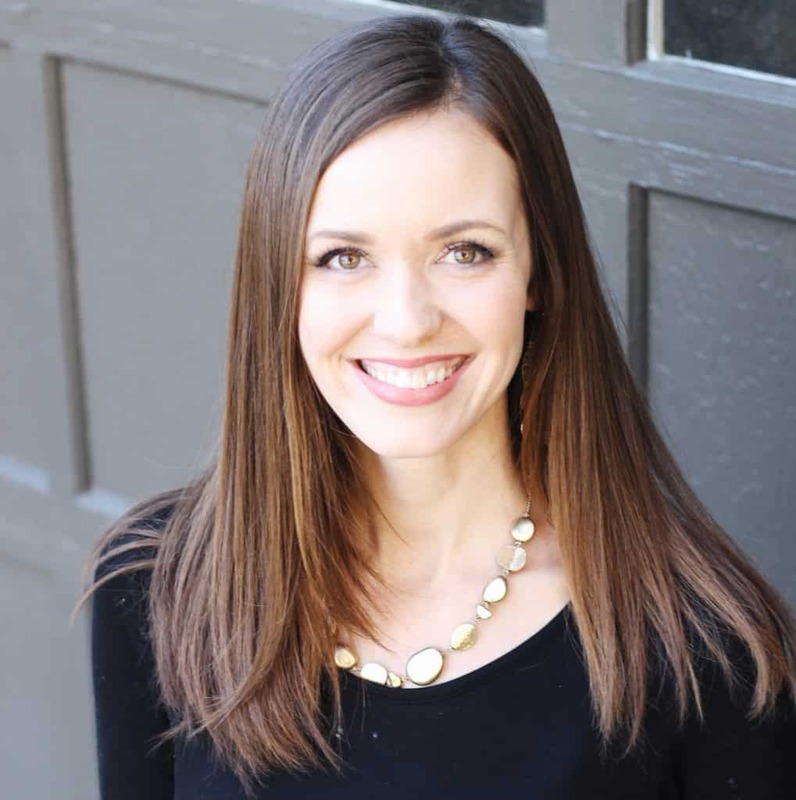 Anna from The Measured Mom is a former teacher turned SAHM with many great resources for homeschooling. She has a wonderful Kindergarten readiness guest post from a Kindergarten teacher that will help you measure your homeschool preschool year with examples of what’s considered “On Target”, “Mastery”, or “Red Flag” for multiple areas of learning. Jamie from Simple Homeschool. She nails how to homeschool preschool with examples of how life is the curriculum and how you can be intentional with your preschoolers at home teaching them SO many important things. She is not trying to sell you a curriculum but rather show you how to teach life skills. I would love it if you would leave me a comment with what challenges you face when it comes to starting preschool at home. I’d love to know! Also, you can follow Blue and Hazel on Instagram too. I absolutely love everything you said in this post! Preschool is right around the corner for my kids and I’m determined to homeschool, but it’s almost terrifying thinking of having the responsibility of teaching my children everything they need to learn. I struggle with coming up with creative ways to teach my kids, but I’ve been finding that I don’t have to bend over backwards to teach them. Everything you said is so encouraging to me and it reminds me that I don’t have to be perfect in doing this. Thank you!!! Sarah I know exactly how you feel! It’s strange how we can feel overwhelmed by teaching preschool but it’s nice to know you can’t really mess it up too much. Good luck to you and be sure to check back for new posts as we discover more preschool ideas. Thank you, this post is perfect!! I’m a stay at home mom from South Africa, determined to homeschool my 2 kids, but most of the time I’m just overwhelmed by the idea of it! Hi Natasja! I’m so glad you found this helpful. I see tons of “activities” all over Pinterest for preschoolers, but it was harder to find “a day in the life of” a homeschool preschool that didn’t scare me away. This is working well for us, and I know you can do it too! Did you get the free daily checklist printable? Great post! Thank you! My 5 yr old twins have chronic lung disease from being born at 26 weeks. They had been in a halfday preK but with all of the sickness and flu this winter my husband and I decided to start homeschooling. If they were to get the flu it wouldn’t be an easy recovery and we have spent enough time in hospitals. I agree with blocking out the time. I do unit learning with a different subject every week or so. Pinterest has so many resources. Coming up with crafts and science experiments is easy for me but I’m overwhelmed when I think about teaching them to read. Thanks for the links! I just ordered the book you posted so hopefuly that will help lead me! I think my greatest concern is missing something and making them behind. We haven’t decided if we will homeschool for kindergarten or not but so far we are having lots of fun! Wow that sounds like a really good decision for you guys. You are a strong mama for doing what you think is best for your twins, as it sounds like it’s been a hard road. I would love to get a bit more organized to try weeklong units like you said, great idea! I hope you find the book really helpful. My only advice is to read how to use it before sitting down with each kid, and maybe even practice by yourself so you get the hang of what to do those first few pages. We have taken it slow, sometimes half a lesson a day if his attention is short, and it really works. Let me know how its going! This was a great read! I think the routine is the best part to add. If there is a routine, it is easier to say no to certain disruptions and focus on teaching. Hi April! You are so normal to feel that way! In all honesty, I think most two year olds in preschool are there because either their parents work or mama needs a break! Not at all for academic reasons. I used to feel guilty for not having all these fun activities at home like they might get at “school” but really the kids are happy so long as mom is with them and paying attention. Keep up the hard work! Liz, thank you for your post. I’m sure new parents will find it helpful. I worked in Early Childhood services (birth to five) as a speech pathologist. I wanted to reassure you that even on those days that you feel you aren’t doing something specific, you are still naturally teaching skills to your children. Even a walk (not sure how that is done with three children😊) is a learning activity. Parents have the wonderful tool of language and kids are sponges! Every time you describe what you/they see or do, you are providing a language lesson—you can’t help it, it just happens naturally. You might not have it exactly planned what concepts you’ll be introducing—that makes some uncomfortable. But you’ll be using lots of vocabulary (color, shape words, number words, loud/quiet, warm/cold, rough/smooth, etc.) just by talking as you go on a walk. This can happen during any activity, not just walks. I just want you to know that it can definitely be counted at preschool teaching even when it is unplanned—as long as you are talking! preschool for my almost 3-year-old, although she tries to keep up with her older brother ;-). She already knows so many things just from listening to me talk to my 4.5 year old and from chatting all day. I would love to write a whole post on the importance of what you have said because it is very true! I teach Pre-K. I’m a certified teacher with my Master’s Degree. While you are on track with what you teach, much more needs to be added to your at home curriculum. Children need to know numbers up to 30 and how to write them. They need to know ten frames & sets 0-10. Other math concepts include: coins, basic 3-D shapes, Patterns AB, AABB, & ABC . For Reading , children need to know syllables, parts of a book, author illustrator, framing sentences & words. Children need to know punctuation marks. They need to know basic sight words, basic word families as well. They should be familiar with how to use a computer and know to recognize their given first and last name. They should be able to write it according to the Zaner-Bloser Method of writing. Thanks for taking the time to write all that down and I will surely be looking into this! I know moms want to make sure they don’t get behind so very good information here. No way! I’m also a Master teacher. Most of those skills are Kindergarten skills. Pushing so much so early takes away from building a SOLID foundation for future learning. Pre-K kids should be learning 90% through play. Don’t scare off the parents-while I obviously think preschool is great-parents can do most academic skills at home just through interacting throughout the day! I have to say, while all of this sound “certified teaching” we have never met these kids. We don’t know how they learn, what their interested are or how long their attention span is. I know that I know my daughter, how she understands things, I can see her figuring things out on her own and I can see when she needs help. Every child is different and they all learn different thing at different times… they don’t NEED to know numberd 1-30: they need to understand that numbers continue past 10, they don’t NEED TO recognize syllables, they should want to pick up books to “read.” All of the random standardized requirements that you wrote are fine for a school setting, but she’s homeschooling. Not the same thing, not the same pace, and she’s not a teacher, she’s their mom. Thank you for being a teacher, as I understand it’s an overwhelming and underpaid position, but lumping all kids to one way of learning is probably not conducive to learning, or mothering for that matter. Just my opinion. In Pre K? You’ve got to be kidding!!! Not sure where you got your Master’s degree, but my MA and 43 years or teaching young children has shown me differently. When children are given the opportunity to make learning fun and meaningful, they will learn AND UNDERSTAND what they need to move on to the next stage. Amazing advice! Thank you! I would put this on my top 5 favorite posts I’ve ever read. Thank you so much for the nice words and I really hope it helps get you started. Stay tuned as I’ll be adding new posts on specific preschool activities we are trying out at home soon! Kathy is right. Here in Ontario, Canada we have 2 years of full day kindergarten with the kids starting in the year they turn 4. They are introducing them to sight words and learning about the author and illustrator of the book they are sent home with daily in their first year. They learn patterns mostly through their crafts and activities so it is play based sort of. They are learning addition and subtraction up to ten not just counting up to ten. Just because they are using craft supplies and such to teach these concepts does not mean it is unstructured and unplanned. So when you consider there are a lot of 3 yr olds still in pull ups and at 4 they have this many expectations put on them you have to wonder if we are pushing too much. COngrats for taking this on! My kids are now in 1st and 3rd, and I am proud that our district just this year started offering a full day Pre-K, free of charge. More areas should implement this. The cost is really crazy. I can see why some opt to do it at home. Plus then the schedule gives you the flexibility to work around trips to the zoo, museums, playdates, other kids naps. Thanks! The flexibility is very nice for sure as well as watching them learn. And yes, the cost of preschool is high enough to deter many and I’m glad you could be part of a free one! Thanks for the nice words. I think you are so right about “playing”, and preschool could definitely be called “playschool”. In fact, that’s mostly what the day consists of and how my kids learn…through play and chatting with mom! That’s one reason why I think any mom can succeed in homeschool preschool. Thanks again! I felt the same before starting with my 3 & 4 year old. I really believe you can do it all without buying much! Of course there’s a bunch of stuff that you could buy that might be fun or helpful, but with preschool you can really do it all with free resources too! Yay for all those free internet printables and parents who care 🙂 Good luck! Love your post! As a mom of 3 myself I can definitely relate to everything you said. Your post has motivated me to just start “doing” preschool with my older two children. Your suggestions are very helpful. Thank you for sharing. Hi Rosemary, sounds like you and I are in a similar boat with three littles! I focus the most on my older child who is 4 and let my 3 year old participate when she wants to as her attention span gets better. Keeping learning and play fun & low pressure is my goal! As a mom of 2 girls with a third baby on the way this summer, I feel short on time and feel guilty that I don’t do much with the girls. My oldest will be 4 this month and hence it’ll be officially time for preschool this year. Some things she knows great and others I haven’t even addressed to teach her. My husband is a stay at home dad and thankfully I have 3-4 days off a week from work so I can help with preschool stuff. My oldest will go to preschool more for socialization than anything else ( just VPK) and I keep wanting to do stuff with her at home than just “ send her to school”. I got some good ideas in this blog. Thank you! It sounds like our kids are about the same ages, and I feel ya when it comes to feeling like you want to do more but feel short on time. Be encouraged that you can teach preschool at home and even just talking and answering their random questions is a huge part of it! As a former preschool teacher and current homeschool mama, I think you are spot on! Of course, any family can add or subtract to these plans based on their child’s needs and abilities. I always like to know what my local school system deems important for children the ages of my own to know, however, when you are homeschooling your gauge won’t measure up exactly. I don’t think it’s important to recreate at home exactly what the public or private schools are doing if you intend to continue homeschooling. There are, of course, basic skills that can help set children up for success, but in general education is not one-size-fits-all and you have the freedom to decide what and how you teach your kiddos while exercising wisdom and discernment to guide you! 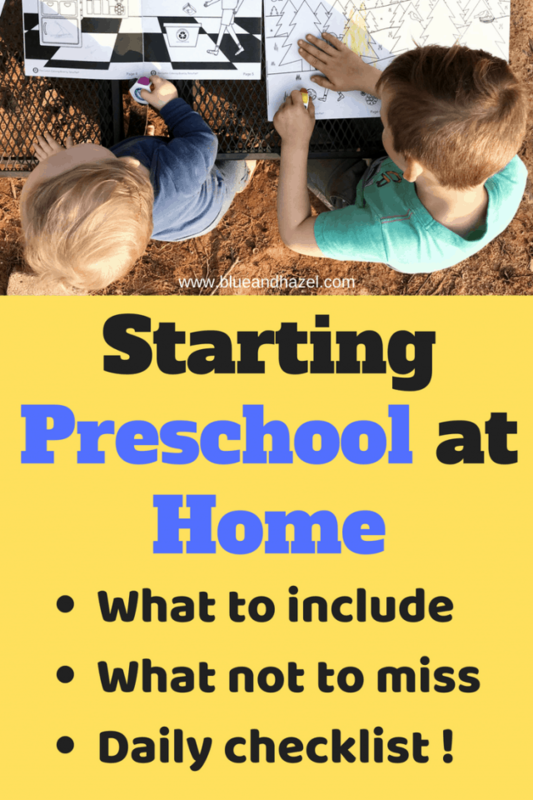 Your preschool guide is great, and I will be using many of your ideas in my home! Thanks! I love what you said about knowing what your local school system is doing and wants kids to know as a guide. It’s nice that homeschooling at this young age gives us the option to be flexible with starting things when our kids are interested and ready! Thanks for stopping by and glad it gave you some ideas. Jennifer thanks for the awesome encouragement! Good job with your 3 year old. 20 minutes at once is pretty awesome! I completely agree with loving how you can speed ahead or spend backtrack on things as well. I’m excited to see some of the differences in a kindergarten curriculum, especially since we have been learning to read early. Learning how to teach preschool at home has been a great time for us. I love that you make it non-stressful by breaking it up into really small blocks! Our little girl is approaching preschool age and really seems to love to learn so these ideas are great. Also we have some water wow books that we LOVE but I have never seen those alphabet cards you posted! Will definitely be getting some of those! Great ideas! I homeschooled my oldest for preschool, and I LOVED it! I still have some of the things I used and it has really come in handy with my other kiddos. One thing I really like to do is take my kids with me to the dollar store and have them pick some things out to do fun crafts with. Hi Shiree, that is such a good idea to see what they are drawn to at the dollar store. I think my kids eyes would get BIG! haha. But that is an affordable place to get lots of preschool crafting supplies, even for the non crafty mom like myself to do hands on preschool at home. This is so encouraging! I’m a mom to a 5,4,3 almost 2 and due in August with another. Teaching my kids has been so intimidating to me because I felt I would make them behind. After reading this, I felt encouraged in not being alone and just starting. I started my 5 year old in learning her sounds for letters. Still trying to find a good routine. The crafts and activities is my biggest challenge because I’m not creative and with little ones around it can be hard to do all that. I need to start my routine because my 3&4 year old act out when they have nothing going on. Sigh! Thanks so much for this again! Hi Maribel, you are one busy mom, so good job for everything this far! You are not alone in worrying your kids would get behind. You can use what your local preschool and kindergarten expect as a guide for learning the very, very basic academic things like sounds, letter recognition, and other things I mentioned above and then add in a fun activity when you can. As a homeschooler, your kids may not do all the crafts you would see them do at preschool(because who has time for all that when caring for younger kids?!) but they do have each other, hands on play outdoors, and “field trips” with mom that teach a lot! I’d get one or two staple activities you can pull out once a day like Play Doh, or sticker activities, that are zero prep and hands on. You got this! I was trying to get my son who is almost 3 to sit and learn numbers/letters for 30 mins at a time. then getting annoyed with him when he wouldn’t (i know.. stupid) I was expecting wayyy too much from him and I realized at times I have more patience with my students than my own son. We are Australian expats living in Vietnam. I am constantly getting the question..
My husband and I are teachers and we work from home. Of course we would love a break, but the thought of sending him to a (really REALLY expensive) international school here purely just to give ourselves a break sounded bizarre. We can teach him just as well if not better at home. I’m so glad this was helpful to you! I haven’t had to homeschool kids older than preschool age yet, but I know you can definitely do it! I also tried introducing a lot to my son around age 3, and he had no interest in anything other than just play. When you get asked what you are doing for school it’s easer to just say “we are doing preschool at home”. Although it’s very similar to ordinary life before I called it “preschool”, it answers people’s questions and we are actually doing a few added things that I’ve mentioned in the post. Don’t feel any pressure! And what I’ve found, is that it becomes obvious when to try something new, because the old gets easy. For instance, instead of tracing a letter, he’s getting excited about drawing it on his own with a blank piece of paper. So preschool progresses toward Kindergarten naturally, even without knowing what skill goes into which grade. Good luck! Also I’ll try the sink or float game, thanks! I love your emphasis on learning as an integral part of everyday activities like matching socks! We are still focused on play based learning but I would like to add a routine, as you said I think it would be helpful for my daughter to know what is coming up next! Hi Haddie, Yes when it comes to preschool I’d say most of the learning comes from doing life with mom. For us, that means that instead of me doing everything alone faster (like matching socks or measuring ingredients), I can try and include them. It goes a lot slower so we don’t do that every time, but I know it’s part of their learning when I do! Melissa you are welcome and please feel free to let me know if there are some things that you would like more help with or would like to see more of on the blog!You can homeschool preschool, and as your kids grow and ask questions there will be aha moments for you on what they are ready to learn next. I am a retired school teacher of 22 years. I taught 1st for 11 years and kinder for 11 years. I am now teaching prek part time at an accredited preschool. You have done a good job of researching what is needed for incoming kindergarteners. You also have a great schedule set up. I am also glad you mentioned pintrest; it has so many great ideas. You can use different themes to drive the teaching and tap into your kids’ interests. Be careful of using too many worksheets and workbooks. You can teach letter writing by tracing letters in sand, flour, salt, etc. I always enjoyed letting one good book drive my teaching and activities. I am hoping to teach my grandbaby during her preschool years. You are really helping some moms out there who can’t afford private preschools. You are helping them realize they can do it. What an encouragement to other moms and myself that they can teach their child preschool, thank you! Your background in teaching is so helpful too. I agree with you about not using too many worksheets and will keep that in mind at this age. I did actually try a letter tracing workbook with my son and it was too dull for his age and interest. While he does seem to love those dry erase letters,tracing in salt or flour would be an excellent thing to try, thank you! Thank you for this blog. What an encouragement. I am trying to figure out where to start and this relieved my concerns as I was trying to make it too complicated. Thank you also for including the books you used. There are so many out there and I was at a loss as to where to start. Thanks again. You can totally homeschool your preschooler, you got this! Set aside a little one on one time each day. Also find a friend who is homeschooling or a friend that you can visit each week so your preschooler can play with kids his/her age. 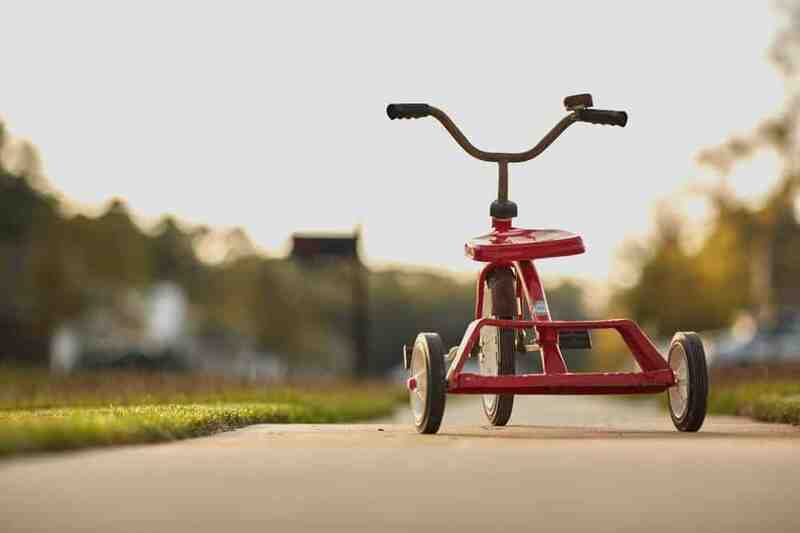 That has been one of the trickiest things for us as my preschoolers approach age 5 and 3.5. Glad to have you here! This post was so informative and practical. I bought many of the suggestions. I’m doing the Horizon curriculum bc I found it at a reduced price but the teachers guide was so overwhelming and scripted that I did not find it sustainable. My kid plays like crazy so thank you for the reminder/encouragement. The expectations on kids is so crazy and really any benefit from preK is lost by 3rd grade so shoving material into a 4 yr old feels wrong. You are not in NC by chance? I feel like we would be good friends! 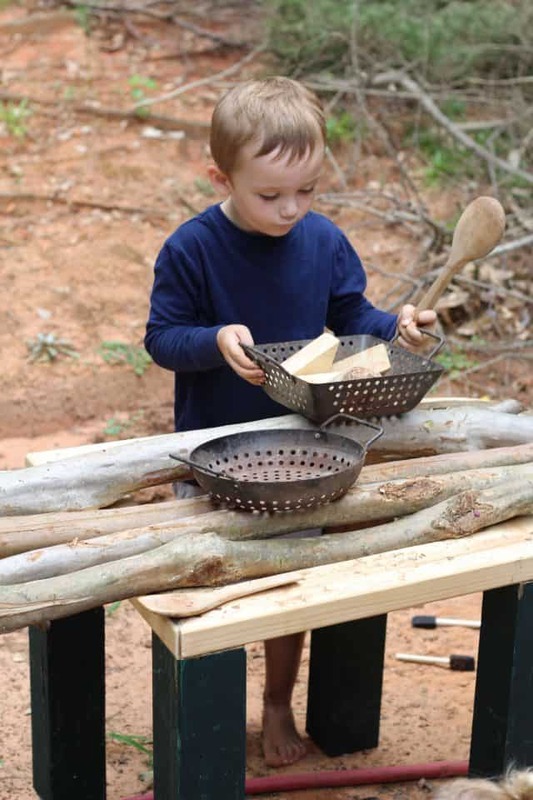 I hope you like some of the same preschool tools we have used! It’s a very laid back approach that we like. I don’t live in NC 🙁 But do look up your town name + homeschool group on FB and see what pops up! I just found a couple groups we are looking into because all the kids my son’s age (5 now) are in full time Kindergarten so play dates are not much of an option. Wonderful Encouragement!! Thank you for the early – reading resource! I have homeschooled one preschooler and on the second one now. I missed the importance of the cutting and gluing at preschooling with the first one. Her cut out book is a great tool for them! Any glue(stick) projects are good for them too! Additional resources we lean on are Miss Hubbard’s Cupboard (God-Send!!! ), Easy Peasy School, Starfall Calendar (talk about weather and sing day of week song) And on YouTube: Miss Booksy and Cosmic Yoga Kids. It’s a great way for them to learn and for mom’s to get a few things done or prepare for the next thing. We do tend to keep things a little structured but it doesn’t have to all be in one consecutive sitting. The kids just know what needs to be done. Pre-K 7-10min increments of each subject we tackling 3 days a week. Almost all things are done by exploring and typing in “Kid events (your city name)” to find free events in the area for the week. We tackle as many as possible. Who doesn’t love field trips!! Tosha thanks for the insight on how you do preschool. I can’t wait to check out some of the resources you mentioned! I have not done any glue stick projects but would like to try some because my kids do that at church and love it! I agree that it’s easiest to spend short amounts of time for each activity. My latest challenge is finishing even short tasks without an interruption from my 18 month old. It can be very frustrating for my oldest who is constantly having to stop and start and wait for mom. Any advice would be appreciated! I’m so glad that I stumbled upon you! Thanks for the reminder that they are still little kids and not to over-complicate things. Playing is learning. Thanks Loren! Yes playing is learning. And, there are many ways to teach the same thing. This really helped me when I was feeling fearful that I was missing something if I didn’t use someone’s cool printable or buy the right books or do circle time. Enjoy these years with them! Gloria, that’s quite amazing and I’d love to know where you are from! This is a wonderfully detailed post! I appreciate your honest take and snapshot into your day. I started out homeschooling with the aim to get my oldest (bonus) son kindergarten ready. We just never sent him to kindergarten. Our local public school even provided us with simple lists of skills partitioned out by quarter so it was easy to make sure he was on track. Your laid back approach needs to be praised! You are leading your kids to light the fire of their own passions. Learning can be quite the adventure if we don’t try to force them to do it. Like pushing someone off a diving board. What a great support your local school was for you! That’s awesome. I see you offer homeschool coaching! That will be a big help for parents just getting started. I am getting ready to start some simple preschool with my oldest (just turned 2) I also have twin 1 year olds and another baby on the way. We are planning to homeschool as long as possible. It is nice that there are many toddler learning shows but, I’ve also found that wooden puzzles work well for teaching letters and numbers for my boy. And playing with blocks he learns a ton! I love hat I can “school” my kids all day and make it fun. And there are so many great printables and resources! Congratulations on baby #4 coming, and I think you are seeing how much learning happens naturally at that age when you are with your kids! We didn’t start anything formal till around age 3.5 with either of my kids, so don’t feel pressure to do all the things at age 2. Have fun with them! This is a great post! You did a good job of covering all the bases. I think new homeschool mom’s will feel empowered after reading all these great ideas and tips. Thanks Heidi! My goal is that any mom that wants to homeschool preschool realize that she is able and that it’s not about being Pinterest Perfect!